Most authors hope to enjoy a well-attended signing event when their new book drops. But venues for such events are harder to come by, as more and more bookstores close down. One author, a Central Coast native, has actually premiered every one of her books right here in Santa Maria at none other than The Bookworm. Elizabeth Fields, who writes young adult books, premiered her very first book there years ago, and also unveiled her newest book, Welcome to the Carnival, at the cozy bookstore on July 26. Elizabeth Fields debuted her new collection of middle school age horror stories, 'Welcome to the Carnival,' on July 26 at The Bookworm, where she has launched every one of her books. Fields grew up in Los Alamos and was born in Santa Maria, but she recently relocated to Boise, Idaho, with her family. Even so, she traveled all the way back to the Central Coast for her latest book launch. The event at The Bookworm was well attended by longtime friends and some family. The newest book from Fields is a collection of short horror stories for middle school aged readers. Her last two horror story collections, Let Them In and Don’t Let Them In, are intended for young adults 14 and older, she said. Those two books are currently in pre-production for a motion picture with some collaborators popular in the horror genre, Fields said. The stories don’t rely too much on the supernatural, she said, but focus on scares that could possibly happen. 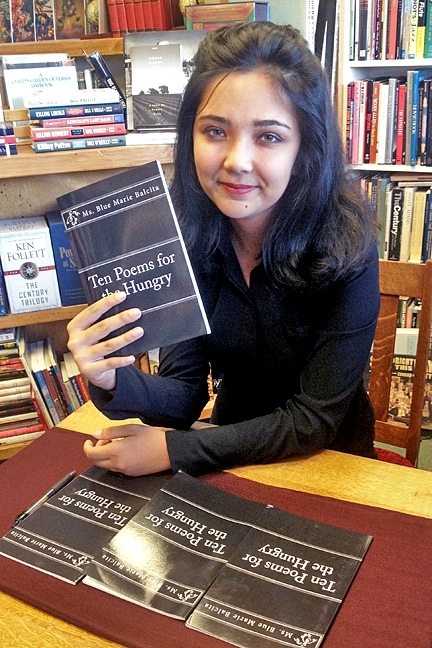 The 16-year-old poet Blue Balcita signed and sold out of most of her books of poetry, including her new book 'Ten Poems for the Hungry,' on a July 27 author event at The Bookworm. The following day The Bookworm hosted another author event featuring Blue Balcita, who was selling her books of poetry. She had entirely sold out of all but her latest collection, Ten Poems for the Hungry, which featured poems about her experiences while homeless at the age of 13. Now 16 years old, Balcita explained that she was able to transform her life with the help of poetry, inspired by poets like Charles Bukowski. Her latest book is also the subject of an upcoming film, she said, a documentary about her life. She is based out of Quincy, Calif., but travels the country with her books. Balcita came to Santa Maria to visit family, she said, and chose The Bookworm as the location to hold a book-signing event while in town. The Bookworm bookstore in Santa Maria regularly plays host to book signing events by local and traveling authors. You can check out upcoming author events at thebookwormcali.com or stop by the store at 230 E. Betteravia Rd., Santa Maria. For the owner of The Bookworm, Darin Gabler, who bought the store in 2012, author events are something he wanted to do when he first took over. There used to be an open mic at the shop too, he said, but the store was too small for an audience event like that. With book launches and other events, Gabler said he hopes that The Bookworm can serve as a cultural hub in the community. Arts Editor Joe Payne is all about stories. Contact him at jpayne@santamariasun.com.